Allan Graham and Gloria Graham created Add-Verse in collaboration with 25 poets, many close friends of the couple, between 2003 and 2005. Comprising visual and audio material, great care was taken in paying homage to the many well-known people they worked with. 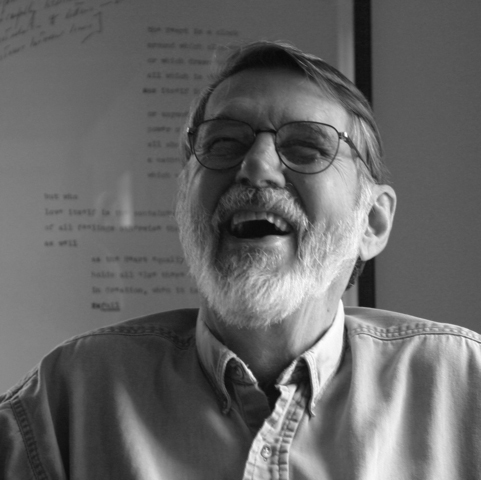 A two-hour video loop filmed by Allan Graham documents approximately three to five minutes of each poet reading aloud in his or her own voice. The camera is unmoving, focusing on a fixed point while the work is read. But the subject of the camera’s focus is surprising. Instead of capturing the face, expression, and lips of the reader, the camera films their hands and the manuscript so sometimes we see printed pages, other times published volumes, and occasionally the writer’s own hand-writing. There is no break in the loop, nor do we know whose verses we are listening to—one writer’s words seamlessly bleed into another’s. Allan & Gloria Graham, “Robert Creeley” from ADD-VERSE, 2004. Black and white photograph, 24 x 24″. Courtesy of the artist. Photograph by Gloria Graham. Gloria Graham’s photos identify the nameless hands and voices in these tapes. Taken during the same sitting as the video, they freeze a moment, showing the speaker mid-sentence or pausing between thoughts. With the two projects side by side—the faces and voices soon become clear: Robert Creeley, Diane Di Prima, Michael McClure, Barbara Guest, Arthur Sze, Anne Waldman, John Yau, and many others. Based in New Mexico, Allan Graham (also known as Toadhouse), has published poetry and his artwork—primarily sculpture and painting—often incorporates text as well. Gloria Graham also works in a range of disciplines such as sculpture, painting, and photography, but is best known for her drawings and paintings based on geometric patterns and molecular structures. Add-Verse was their first collaboration and took them across the country, recording each friend in the space where he or she lives and writes. “We perceive poets as intellectuals/truth-sayers” the Grahams say. The life of a poet, they note “is one of few rewards other than the stimulus of mining the depths of thought and language.” Taken all together, Add-Verse forms one reverent ode to poetry and those who dedicate themselves to its writing.